For sales, rental and service of environmental cleaning equipment, Dawson Infrastructure Solutions serves a diverse clientele, including municipalities, service providers, utilities and industrial manufacturers. 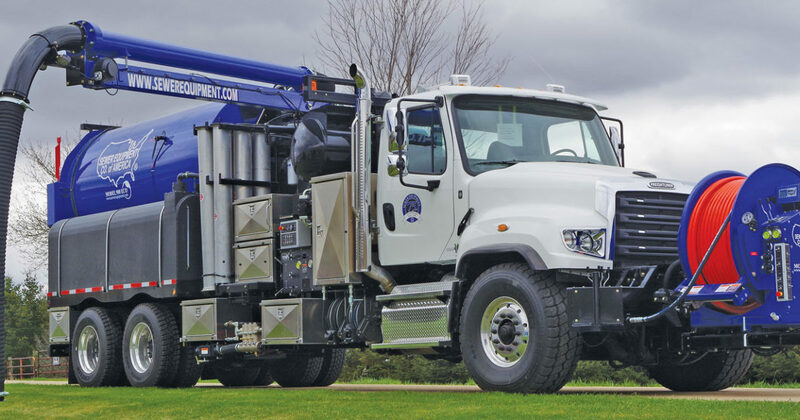 Our product experts are here to help you configure the best equipment solutions for maintaining pipes, sewer lines, catch basins, storm drains, grease traps and sand traps.We offer a broad selection of truck or trailer mounted water jets, along with self-propelled easement machines to take your work anywhere. For the most demanding applications, we configure high pressure rodders to take care of the toughest jobs. And we provide specialized options for root cutting and control. We also offer a complete line of vacuum loader trucks for industrial cleaning, materials transport and site remediation. The cleaning equipment manufacturers we represent include Sewer Equipment Company, Mongoose Jetters, RamVac and USB Sewer Equipment Company. Combination sewer cleaners combine high-pressure water jetting with a high-flow vacuum source to scour pipes clean, then vacuum up the material responsible for blockages, to easily restore & maintain normal sewer flow. Dawson offers Sewer Equipment Co. of America combination sewer cleaners to give you all the versatility and durability you need in a sewer machine. You can jet sewer lines, vacuum catch basins, clean lift stations and perform many other jobs from a platform that’s designed for a hard day’s work. You will appreciate the quality components built into the 900 ECO Combination Sewer Cleaner that utilizes proven technologies to deliver a machine with simplicity that is unequaled in the combo truck industry. As with their leading 747 ECO trailer jet and 800-HPR ECO truck jet, the Model 900 ECO operating platform offers the best in class fuel efficiency and noise reduction for operator safety. Self-propelled easement machines are the ideal solution for efficiently and safely handling pipe cleaning projects in tight quarters or remote access areas. Dawson represents the full line of easement machines manufactured by the Sewer Equipment Company of America. 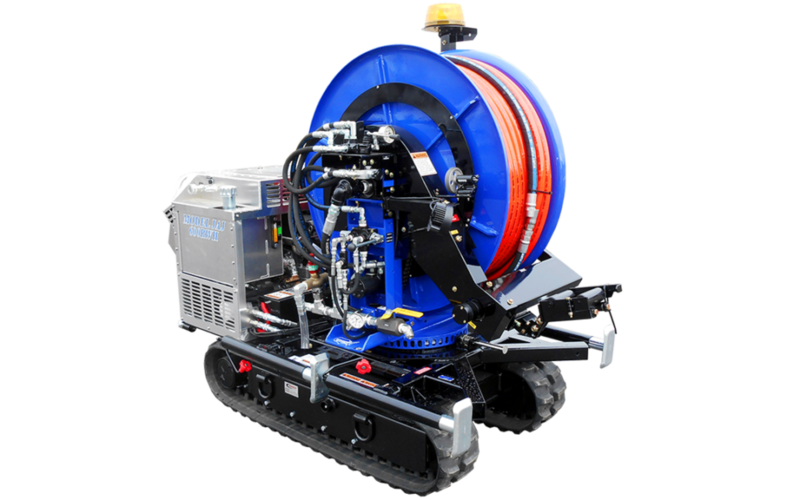 The New JAJ-600WH adds the versatility of extendable tracks to the Sewer Equipment Co. easement machine lineup. With the tracks extended you will be able to traverse grades previously not possible, retract to fit through a 36” gate, and extend again to bring you through adverse conditions that you never thought you could reach. The standard auxiliary tool circuit lets you add a variety of hydraulic work tools to make this unit more than just a sewer cleaner. Self-propelled easement machines are the ideal solution for efficiently and safely handling pipe cleaning projects in tight quarters or remote access areas. Dawson represents the full line of easement machines manufactured by the Sewer Equipment Company of America. The New JAJ-600WH adds the versatility of extendable tracks to the Sewer Equipment Co. easement machine lineup. With the tracks extended you will be able to traverse grades previously not possible, retract to fit through a 36” gate, and extend again to bring you through adverse conditions that you never thought you could reach. The standard auxiliary tool circuit lets you add a variety of hydraulic work tools to make this unit more than just a sewer cleaner. 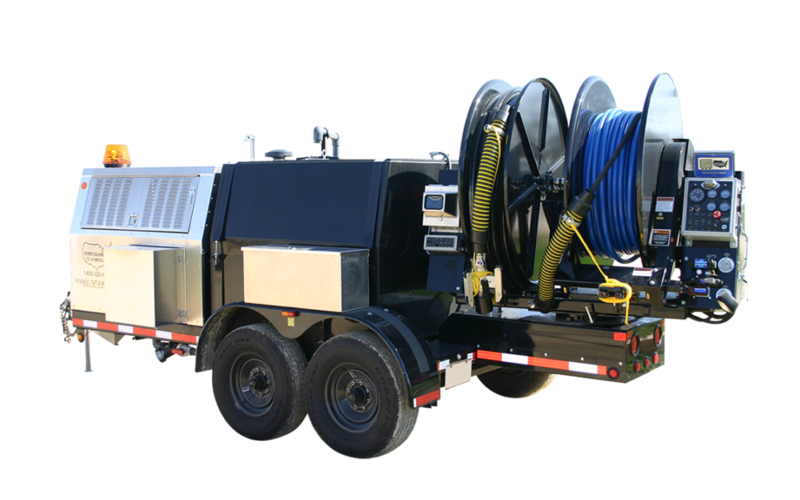 Trailer jets offer affordability and the ability to leverage your existing fleet with the equivalent performance as truck-mounted sewer cleaning jets. 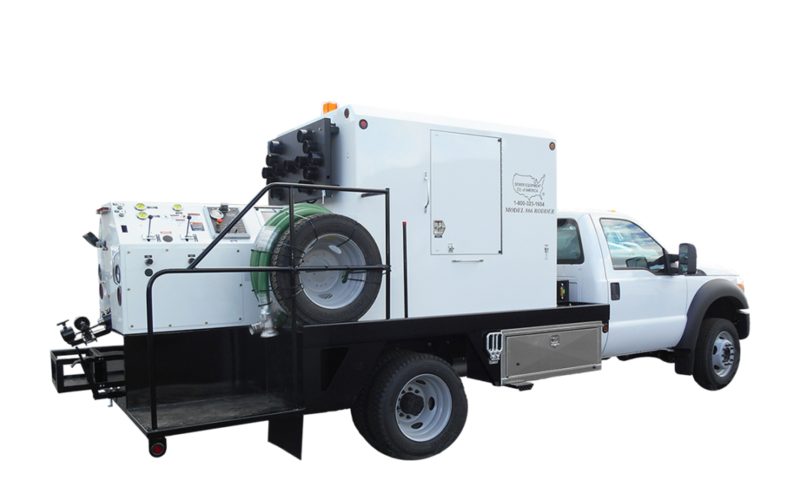 Dawson Infrastructure Solutions represents the full line of trailer jets manufactured by the Sewer Equipment Company of America, including the best selling rotating reel trailer jet in the industry, the model 747-FR2000. Cleaning action is supplied by a high pressure water pump (multiple pump flows & pressures available) powered by either a diesel engine or gas engine. This maneuverable workhorse trailer jet design is capable of effectively and efficiently handling your toughest pipe cleaning projects. 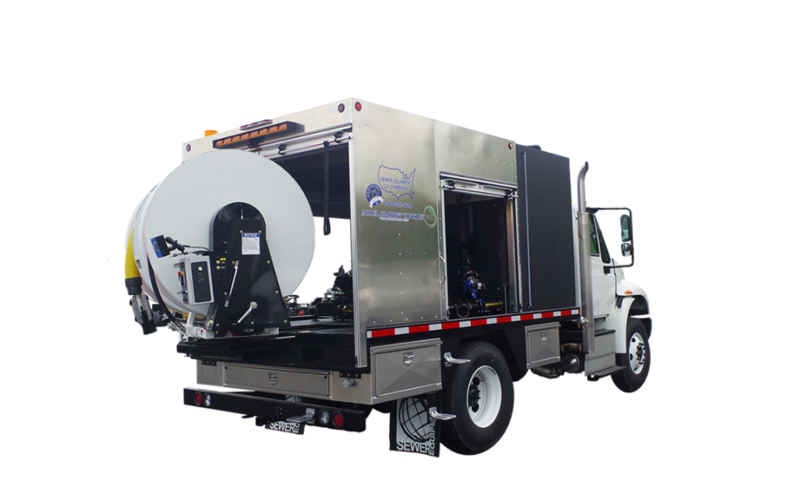 The Model 747-FR2000TV Series II Trailer Jet provides two services that would normally require two machines: high pressure sewer cleaning and color television inspection of sewer lines – all in one machine. The unique “Dual Rotating Hose Reel” provides up to 500′ of patent pending umbilical cord on one reel, and up to 600′ of 3/4″ hose on the second reel…so both cleaning and televising can be done separately or at the same time… this is the only machine of its kind. Most Sewer Equipment models feature hydraulic fluid jetting as well as environmentally friendly performance. We can also configure combination jet / vacuum cleaners, as well as dedicated jetters for the Vaporooter ®Root Foaming System. Dawson also represents the full line of Mongoose Jetters, which offer an even smaller footprint and less expensive system. Most configurations can be pulled with a ½ ton pickup. These models are a recommended solution for many commercial contractors and smaller municipalities, typically for small diameter pipe applications and emergency response. The Mongoose 184 is the most popular model, featuring a 300-600 gallon tank options, high pressure and low flow. Truck jets are heavy duty vehicle-mounted, high-pressure water jetting systems for keeping municipal sewers, sanitary and storm sewer lines, laterals, and drainage lines clean and free flowing. 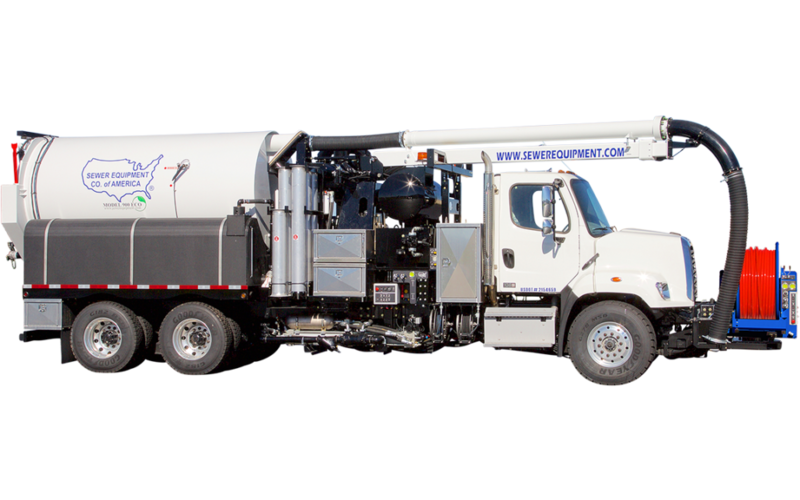 For industrial strength sewer cleaning applications, Dawson Infrastructure Solutions represents the full line of truck jets manufactured by the Sewer Equipment Company of America. The top of the line 800-HPRTV Truck Jet is equipped with the innovative and unique umbilical cord – this single construction cord houses both high pressure sewer hose and a video communications cable. This unit also comes with patented telescoping / rotating / pivoting hose reels. When in operation, the rear roll-up door opens and the hose reels telescope out of the heated rear compartment and then pivot 190 degrees for maximum access to difficult to reach manholes. For many clients, we recommend the 747 FR2000TV Truck Jet as a smaller and less expensive model. It can be mounted on a smaller vehicle and does not require a CDL on most configurations. This is a great solution for emergency response applications. It doesn’t offer the heated enclosure of 800 model, but the small vehicle profile and lower height are also convenient for shops that do not have taller garage doors. This system combine two machines — high pressure sewer cleaning and color television inspection of sewer lines — into an all-in-one solution. Dawson also represents the full line of Mongoose Jetters, which offer an even smaller and less expensive system that also does not require a CDL. These models are a recommended solution for many commercial contractors and smaller municipalities, typically for small diameter pipe applications and emergency response. The Mongoose 184 is the most popular model, featuring 300-600 gallon tank options, high pressure and low flow. These are available in both enclosed and open truck configurations. Vacuum loaders provide an industrial-strength solution for effective & efficient environmental cleaning on roadways, railways, municipal infrastructure, manufacturing facilities, oil refineries, foundries, chemical and power plants. Dawson Infrastructure Solutions represents Ramvac’s complete line of vacuum loader trucks for industrial cleaning, materials transport and site remediation. Remove wet or dry materials, including fine powders and silt. Vacuum loaders are equipped with a highly maneuverable boom and powerful vacuums allowing you to easily move across your worksite. Truck and trailer mounted models from Ramvac are built with this in mind. No other manufacturer in the industry puts the thought and effort into building a machine that will not only get the job done, but will remain productive for years to come. Ramvac’s vacuum trucks help you focus stay ahead of potential problems. When an emergency arrives, you have the right tool to complete the job. With blower capacities of 1400 CFM to 3000 CFM, 4” to 6” hose system and a 320 degree rotating boom, these machines have the power and mobility to tackle any job. Features like 3 stage cyclonic filtration to give your blower the longest life possible and NEMA 4 electrical systems to keep moisture out and down time at a minimum. Other features include a 3 yard debris tank, 600 gallon water tank, 40 gpm @ 2000 psi water pump, plus a versatile rotating and extendable boom to rise to the challenge of any job. You can choose either a trailer mounted unit with an existing truck to pull it or our new hook lift combo unit so you can use your vehicle chassis for multiple roles.